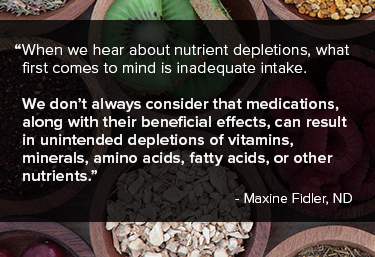 When we hear about nutrient depletions, what may first come to mind is inadequate intake. We don’t always consider that medications, along with their beneficial effects, can result in unintended depletions of vitamins, minerals, amino acids, fatty acids, or other nutrients. Many available resources on drug-nutrient interactions focus on the effects of nutrients on a particular medication, such as why some medications can’t be taken with milk or grapefruit juice. Less often discussed are the effects of medications on nutrient status. To understand how nutrient depletions can occur, we need to understand how drugs are processed. There are three phases of a drug’s action in the body. First is the pharmaceutical phase, where the medication is ingested, and dissolves in the stomach so that it can be absorbed. In the pharmaceutical phase, stomach pH may affect how medications are dissolved. Medications may dissolve more slowly than expected at a high pH, while those with enteric coating may dissolve too quickly at a low pH. 1,2 pH abnormalities can also affect the breakdown of nutrients at this stage. Wondering how a specific medication might affect nutrient status? Access this Drug Nutrient Interaction Checker to find out. Enter a drug name and then click interaction report. Lewis C, Frongillo E, Roe D. Drug-nutrient interactions in three long-term-care facilities. Journal Of The American Dietetic Association [serial online]. 1995;(3):309. Available from: Academic OneFile, Ipswich, MA. Accessed February 11, 2017. Leibovitch E, Deamer R, Sanderson L. Careful drug selection and patient counseling can reduce the risk in older patients. Geriatrics [serial online]. March 2004;59(3):19-33. Available from: Academic Search Premier, Ipswich, MA. Accessed February 11, 2017. Murray J, Healy S. Drug-mineral interactions: a new responsibility for the hospital dietitian. Journal Of The American Dietetic Association [serial online]. 1991;(1):66. Available from: Academic OneFile, Ipswich, MA. Accessed February 11, 2017. Le J. Merck Manual. Clinical Pharmacology. Drug Metabolism - clinical pharmacology - Merck manuals professional edition. http://www.merckmanuals.com/professional/clinical-pharmacology/pharmacokinetics/drug-metabolism. Accessed February 12, 2017. Le J. Drug Excretion - Clinical Pharmacology - Merck Manuals Professional Edition. http://www.merckmanuals.com/professional/clinical-pharmacology/pharmacokinetics/drug-excretion. Accessed February 12, 2017.
van der Heide F. 5: Acquired causes of intestinal malabsorption. Best Practice & Research Clinical Gastroenterology [serial online]. April 1, 2016;30(Diagnosis and Management of Malabsorption):213-224. Available from: ScienceDirect, Ipswich, MA. Accessed February 11, 2017. White R, Ashworth A. How drug therapy can affect, threaten and compromise nutritional status. Journal Of Human Nutrition & Dietetics [serial online]. April 2000;13(2):119-129. Available from: CINAHL with Full Text, Ipswich, MA. Accessed February 11, 2017. Alonso-Aperte E, Varela-Moreiras G. Drugs-nutrient interactions: a potential problem during adolescence. European Journal Of Clinical Nutrition [serial online]. March 2, 2000;54(3):S69. Available from: Publisher Provided Full Text Searching File, Ipswich, MA. Accessed February 11, 2017. Park B, Kim J. Oral Contraceptive Use, Micronutrient Deficiency, and Obesity among Premenopausal Females in Korea: The Necessity of Dietary Supplements and Food Intake Improvement. Plos ONE [serial online]. June 27, 2016;11(6):1-12. Available from: Academic Search Premier, Ipswich, MA. Accessed February 11, 2017. Abimbola FE. Overview of Pharmacodynamics - clinical pharmacology - Merck manuals professional edition. http://www.merckmanuals.com/professional/clinical-pharmacology/pharmacodynamics/overview-of-pharmacodynamics. Accessed February 12, 2017. Langsjoen P, Langsjoen A. The clinical use of HMG CoA-reductase inhibitors and the associated depletion of coenzyme Q10. A review of animal and human publications. Biofactors [serial online]. December 2003;18(1-4):101. Available from: Publisher Provided Full Text Searching File, Ipswich, MA. Accessed February 11, 2017.